Our specialty is Mexico destination weddings but we are fortunate to have photographed weddings in 30 countries around the world. Travel and art is our passion and we love to meet brides and grooms who share the same pursuits! The couple in this image are also photographers who love adventure and nature. 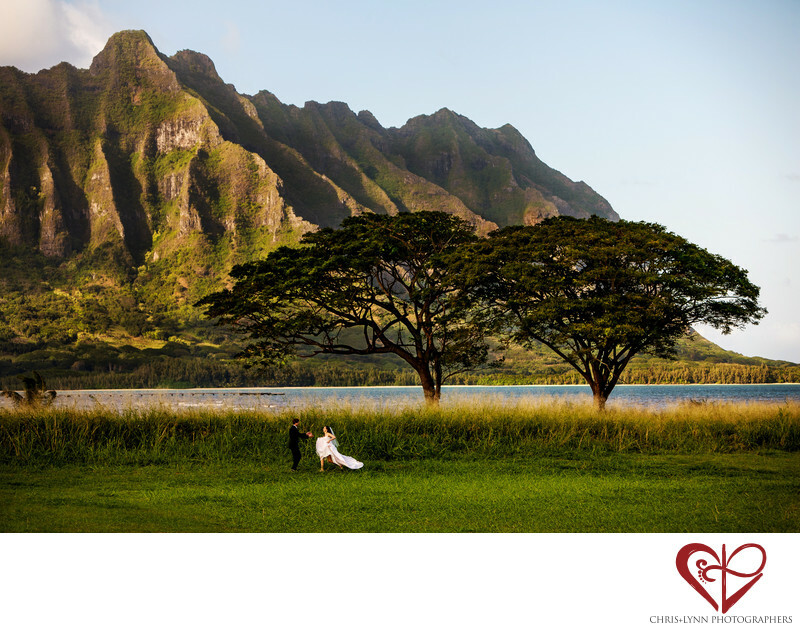 They wanted photos that showcased the beauty of the place they love the most - Hawaii! As destination wedding photographers, we love to create images that truly show a sense of place. The sunlit mountains, blue skies and distinctive trees of this vista truly say "Aloha, Hawaii!" The small bride and groom give a sense of scale to the image; that they are running toward each other but not yet touching gives a sense of anticipation. Before shooting weddings, we photographed for travel magazines and spent much time mastering the art of landscape photography; this is something we try to incorporate as much as possible when photographing destination weddings in Mexico, France, Italy and around the world. It makes us so happy to know this couple made a large art print of this photo for their wall so they can enjoy it every day. In today's fast-paced world of disposable imagery on social media, it is so rewarding to create images that are lasting and meaningful to our brides and grooms. We believe that in addition a collection of photos that tell the full story of the wedding day - from getting ready to ceremony to reception - every couple should have "standalone" images like this one from their wedding. Images that encapsulate the true feeling of the day, images that will be treasured for generations. 1/320; f/4.5; ISO 400; 120.0 mm.